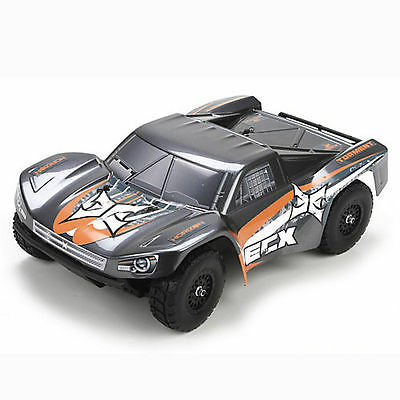 Here you have an Electrix ECX01001 1/18th Scale Ready To Run 4WD Torment Short Course RC Truck !! This package includes the Ready To Run 18th Scale Short Course Truck, Transmitter, Batteries, Charger, Owners Manual And Original Box !! Please understand that this package will include the complete RTR Electrix 4WD Truck, the Transmitter, Batteries, Charger, Owners Manual And Original Storage Box. You can simply open box, charge and install batteries and you are up and running !! You can't go wrong here when you will receive a Brand New Truck, you have a Low Purchase Price Of Only $89.00 and if you buy it now, you can receive it in just a "few days" !!! This is a Brand New Teriffic Truck and there is only this one available at this Great Price !! Review all photo's to see & Buy It Now Or Loose Out ! !